A facelift, or even non-invasive ‘liquid facelift,’ will not make you look 20 years old again — it’s not supposed to. However, a facelift can help improve and even eliminate the most aggravating signs of aging, such as sagging skin, jowls around the jawline, and deep wrinkles and folds. Also called a rhytidectomy, a facelift is the ultimate in facial rejuvenation. Excess skin is removed and the underlying structures and muscles are tightened to create a smoother, more youthful contour. Both men and women who seek natural looking youth and an improved contour of the lower jaw and neck are excellent candidates for a facelift. Facelift surgery cannot stop the aging process, but it can make you look 10 or more years younger and lasts the remainder of your life. Small incisions are hidden in the hairline and behind the ear. The muscle is tightened and excess soft tissue and skin is removed to smooth out the skin and look naturally youthful. WHAT IS RECOVERY LIKE FROM FACELIFT SURGERY? Facelift surgery is performed in an operating room under anesthesia, for maximum patient comfort and best results. Patients may return to light daily activity after two weeks. 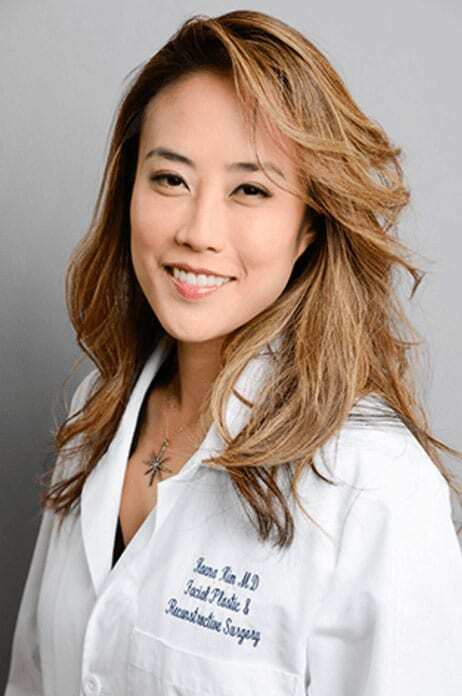 Dr. Kim speeds up her patient’s recovery time, and reduces bruising or swelling, by recommending oral vitamins, arnica, and bromelain during the recovery process.